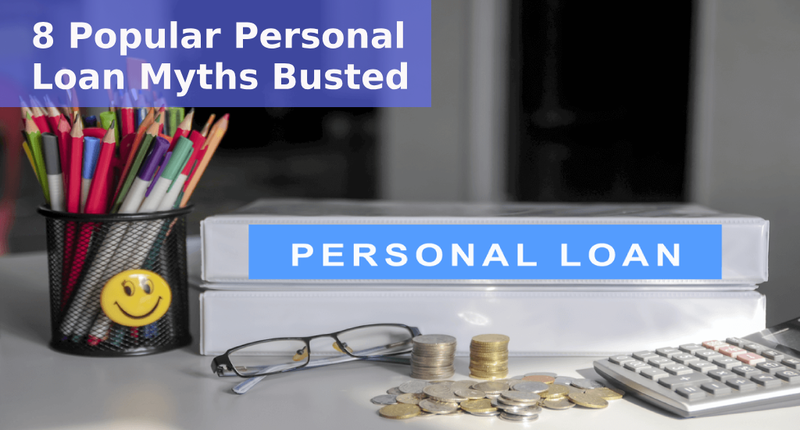 8 Popular Personal Loan Myths Busted! People sometimes find themselves in financial emergency. Best personal loan helps you when you need such quick access to cash. The simplified application process, quicker disbursement, no restriction on the end use of funds and many more distinct features have made personal loans, the choice of millions. You can also get these collateral-free loans sanctioned in 48 hours and lift yourself out of undesirable financial crisis. Despite its growing popularity, there are certain misconceptions about personal loans because of which many people are reluctant to apply for it. These myths are the main roadblocks that keep people away from enjoying the benefits of personal loans. You may be one of them who considered applying for a personal loan but were afraid to take the next step just because of the stories you have heard about the risks of taking a personal loan. Old facts and stories have given rise to misconceptions over the years. Let’s find out the facts and separate them from the myths. This is a popular misconception that people quickly believe and don’t want to apply for a personal loan. Just because of its name, most of the people think that personal loans are meant for personal purposes only. The truth is that a personal loan can be used for almost any purpose like medical emergency, home renovation, child’s education, vacations, debt consolidation,wedding etc. It is a widespread misconception that you are eligible to apply for a personal loan only if you have salary slips, an offer letter and company ID. Even self-employed individuals, private businessmen and NRIs can obtain personal loan. In fact, some lending companies grant personal loans against house rent income. To some extent, a bad credit score affects your eligibility for a personal loan, but it does not eliminate your chances of obtaining a personal loan. Factors such as your income, your personal and professional profile, repayment capacity and your past credit history can certainly boost the chances of your home loan getting approved. However, a bad credit score can impact the interest rate at which your loan is processed or the amount your lender is willing to give you. Moreover, there are some institutions which are willing to provide loans to people with bad credit score. You have a good opportunity to pay your other debts too if you avail of a personal loan. Once you repay the personal loan in a professional and timely manner, you also improve your credit score. This is one of the most prevalent reasons why people stay away from personal loans. The average interest rate applicable on a personal loan (12%-16% per annum) is much lower than that on credit cards (2.5% to 3% per month). In times of emergencies, most people draw out their credit cards. Nowadays, it is pretty easy to get a personal loan. You don’t have to pledge any asset as collateral. Therefore, it is wise to opt for a personal loan when you need immediate cash. You could also enjoy the benefits of the seasonal offers and schemes on personal loans. This is one of the biggest myths due to which people hesitate to opt for a personal loan. Please note that a personal loan is not considered as income. When you use a personal loan for the purpose of construction, repair or purchase of property, you can claim certain tax benefits. You can also use money towards down payment of your property and still claim tax benefits. You might have heard that applying for a personal loan entails a tedious application process, large documentation, recurrent bank visits etc., which is a big misconception. On the contrary, nowadays, personal loans can be accessed online that saves your time and effort. Online lenders, with the help of cutting-edge technologies, issue quick personal loans. A personal loan requires minimum documentation compared to other loans. The lender sends a representative at your doorstep to complete the documentation process. The loan gets approved in a few minutes after which you can receive the loan in less than 3 days. You can complete the entire process without stepping out of your house. If you believe that only top banks or NBFCs (Non-Banking Financial Companies) provide personal loan, then you have not done proper research. In fact, smaller banks and other lending institutions provide personal loan at comparatively lower interest rates. There is no rule which prevents you from applying for a personal loan if you have existing loans. While approving your loan, lending institutions check your repayment capacity by calculating your net disposable income after considering all repayments such as loan EMI and credit card payments. If you are juggling with multiple loans, to ease its burden you can use the debt consolidation facility to combine multiple debts into one. Your personal loan application may get approved despite existing loan at the same time, provided your repayment capacity is satisfactory to the lender. Therefore, if you run into any financial emergency, just ignore these myths and apply for a personal loan. For more information about personal loan, you can go over to personal loan page on Afinoz.com.